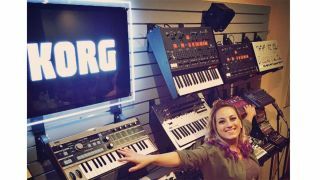 Is Korg about to announce a desktop module version of the ARP Odyssey? It looks like Korg is about to release a desktop version of its recently reimagined slim-keyed ARP Odyssey. In an Instagram post from artist DANiiVORY we can clearly see two desktop editions of the reissue sat neatly next to their keyed counterpart. On display are the white Rev1 and the more recognisable orange and black Rev3; it looks like both desktop modules are simply standard Odysseys with the keys removed. These versions may prove popular given their (presumably) lower prices and the absence of the slim-keys (which aren't to everyone's taste), although we're not sure that you'll be finding much use for the those squidgy Proportional Pitch Control pads on a desktop version. There's no official word from Korg as yet, so it's our guess that this is an unintentional leak. We hope to have more news for you in due course, so be sure to check back on MusicRadar soon.